One more recipe from my finger food housewarming party. These bon bons had quite a success, there wasn’t a single one left at the end of the evening! I bookmarked this recipe a while back, it sounded good but it ended up in the huge pile of things I want to prepare one day or another and was soon forgotten. One night I wanted to treat the hubby to something sweet and I found this recipe again. 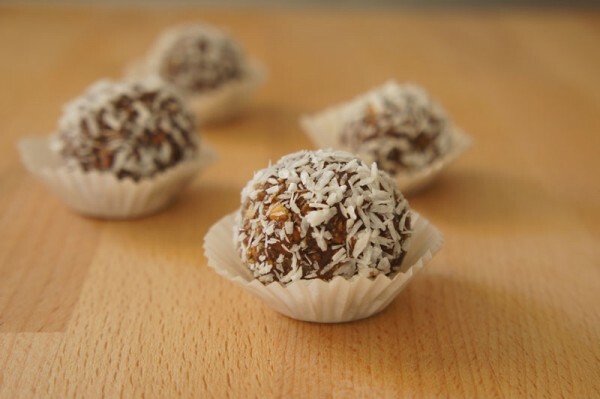 I had all the ingredients at home so I quickly whipped together these bon bons. They were so yummy (we ate them all!!) that the recipe immediately landed in the basket of my favorite sweets. For the party I modified the recipe a little… while I was preparing them I spotted a bottle of Baileys and my brain jumped to conclusions: Nutella + cookies + Baileys = yummy! You can skip the baileys for kids friendly nutella bon bon. Depending on how big you make the truffles with these ingredients you will about 30 or 40 baileys nutella bon bons. Crush the cookies until they are almost like sand. I used a chopper and it took seconds. Chop the walnuts thinly, again I used a chopper. Mix the cookies and the walnuts in a bowl, add the mascarpone cheese, the Nutella and the Baileys. My Nutella was really hard, i.e., cold (Berlin in winter!) so I warmed it in a small pan. Mix with a spoon until everything is well combined. Chill in the fridge for one hour. While the dough chills prepare the coatings and some small paper liners to hold your truffles. 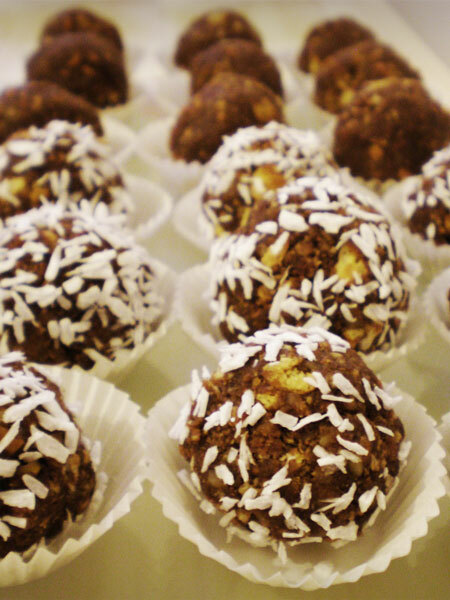 You can coat your bon bons in cocoa powder or coconut flakes or you could do a little of both! The first time I made them I used cocoa, for the party I couldn’t find cocoa (where is cocoa in German grocery stores??) so I made half with coconut flaks and half plain since not everybody likes coconut. Pour some cocoa powder in a deep dish, in a second deep dish pour some coconut flakes. With the help of a spoon take a small quantity of dough and roll it between your hands to make a small ball, about the size of a walnut. Toss it in the cocoa or in the coconut flakes, coat it well and then deposit it in a paper liner. 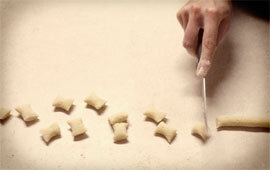 Proceed like this until you run out of dough. Edit 5-16-2012: I made these again and took better pics ;) Even though the ones you see are the only ones left… they are crazy good I can never manage to take pics, they are gone as soon as I am done making them! Ich mache den Teig immer mit Buttermilch und Apfelstückchen. Danke Andrea :) Alle Lebensmittel aus Sachsen sieht köstlich aus! I need to plan a trip there!